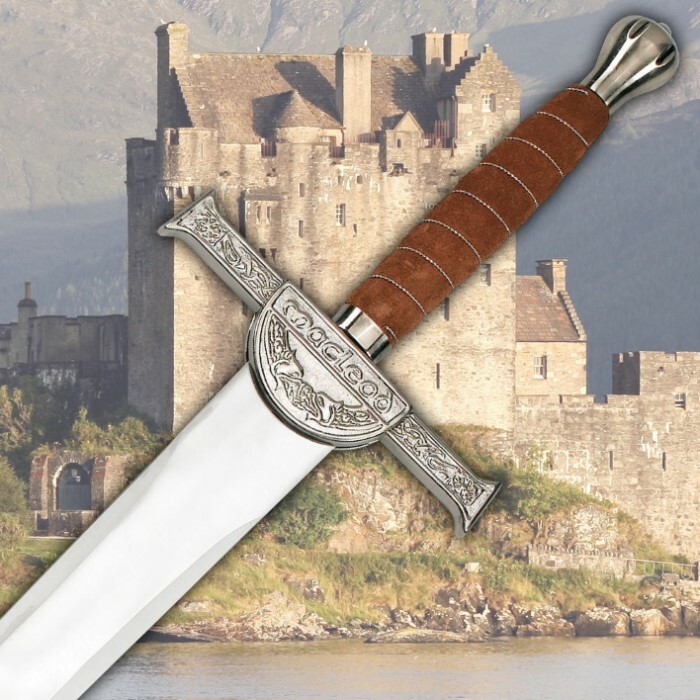 A reproduction of the exact sword of the Clan Macleod, this massive sword features a 38 1/2" stainless steel blade with mirror polish finish. The outstretched guard is blanketed in decorative designs and features a leather and wire wrapped handle. 50 1/2" ov. I’ve had mine for about 6 months, and it’s definitely for display! Don’t want to swing this to hard, as other people said it probably isn’t full tang, and the blade is only a piece of steel, not a sharp edge, on mine anyway, but it shines and looks great on the rack! Just don’t take it into battle! This was my first sword I've ever bought. It's heavy, long, and solid. I gave it four stars instead of five due to the fact that it didn't really have a blade. It was more like a long, slender strip of metal shaped just like a blade. I sharpened it however and now mine's pretty sharp. The tip was sharp though. Good sword. This sword is great, massive, heavy and sharp. The only downside is i read the other reviews saying there was a display and a sheath but alas that does not come with the sword. All in all though it is a great sword. A massive broad sword at a fantastic price. Comes factory sharp, made in Pakistan, high polished blade, and the heaviest and longest sword I own. Comes with a nice scabbord and wall plaque. A collector's dream. If you are Going to display this sword get it. If you want to swing it around do not. It had a bad wiggle. I do not like it. What a beautiful sword! It's very large, and it's a heavy thing, quite faithful to the original Highlander in its design. The detail in the crossguard is just incredible, as is the feel of the grip. I'm not sure about the tang of this product, but I'm betting it's half tang. The blade seems loosely shoved into the hilt, and the grip wiggles a bit. It doesn't fall apart, though, and it would probably take a few good hard hits to a block of wood for it to do so. The blade doesn't appear to be truly forged, in my opinion. It kinda looks like they took a sheet of steel, stamped it, and then beveled down the edge until it looked like a sword. Oh, yeah, and emblazoned PAKISTAN onto the back of the blade. That really kills the Highlander mood. All in all, the sword is good for what it is: a forty-dollar sword, that on a stand, or on a wall, would look marvelous. You could also take it to the local ren-fest if you found a scabbard for it. However, it's not good for swinging around. Which isn't necessarily a bad thing, considering this blade is four feet long and roughly eight lbs. You have to be strong to wield this puppy. I ordered this sword because of it's advertised size and price. I am giving it a 4 star rating mostly due to its great value. Overall quality would be about a 3 but, for less than $40, the value brings it up to a 4. It is big, heavy, and shiny. The blade is partially sharpened. The biggest surprise was Bud K's great customer service. The first sword I received was broken. The tang was shattered due to poor welding and the handle was broken as well. I shipped the sword back in the same box it came in. UPS charged me a whopping $47.22 for return shipping. More than the cost of the sword. Needless to say, I was upset and complained to Bud K. They told me to send them a copy of the receipt and they would reimburse me. They did and they replaced the broken sword with one in good condition. 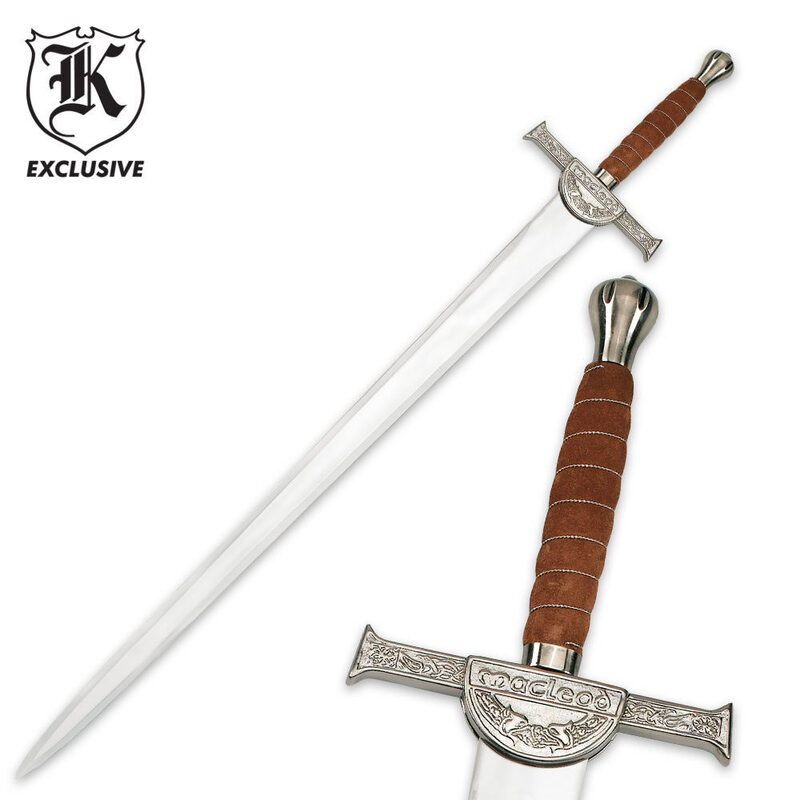 The MacLeod sword is a decent buy but, Bud K's customer service is first rate. I will be doing more business with this company. They truly do stand behind their products. Even the cheap ones. this sword is amazing. right when i got it i was amazed at the quality of the metal. it doesnt come sharp but the sword overall is awsome. This is a nicely made sword, with the only detraction being the overall shiny finish. I traced along the edges of the wording and celtic knotwork with a permanent black magic marker and then buffed it down to give it depth/aging before mounting it on the wall and am very happy with the results, which make it appear to be the sword right out of the movie.